My mom is a wonderful lady. She is also a nurse! And this week is Nurses Week, so she asked me to make something for her to bring to work. Yay! 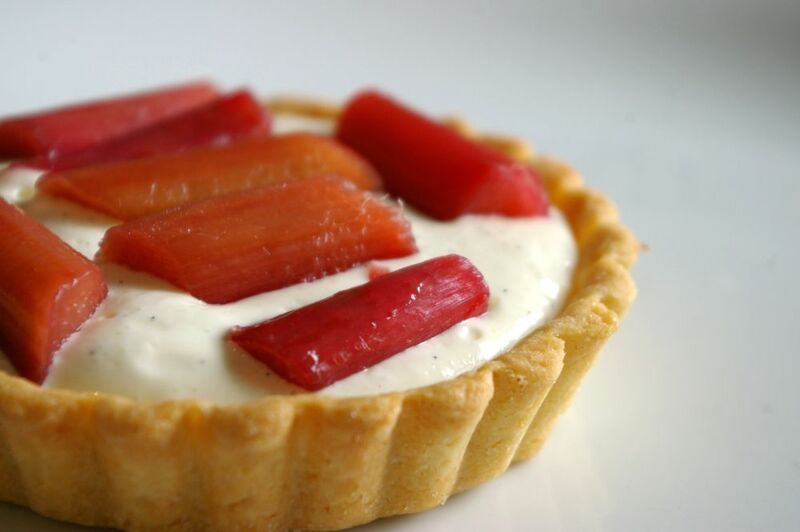 I made some little rhubarb tarts for us at home, and a bigger fruitier one for her to bring to work. I used a sweet dough for the crust, a buttermilk chiboust (is it still a chiboust if you use buttermilk pastry cream? I don’t know!) 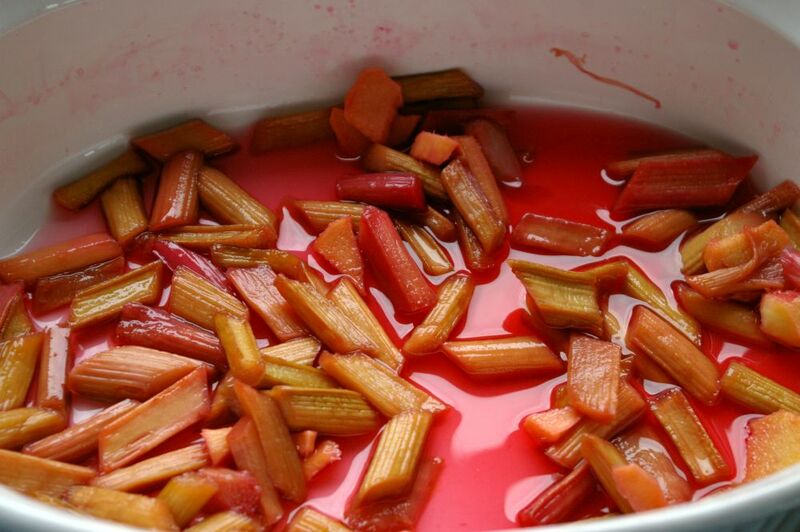 and rhubarb that I roasted with a bit of lemon juice, ginger, and sugar. I wanted to keep it light, not too sweet, and pretty. The rhubarb in my backyard has those thick dark red and green stalks, not the pretty delicate pink stalks of forced rhubarb, but I did my best to make sure they didn’t turn all out green or brown. 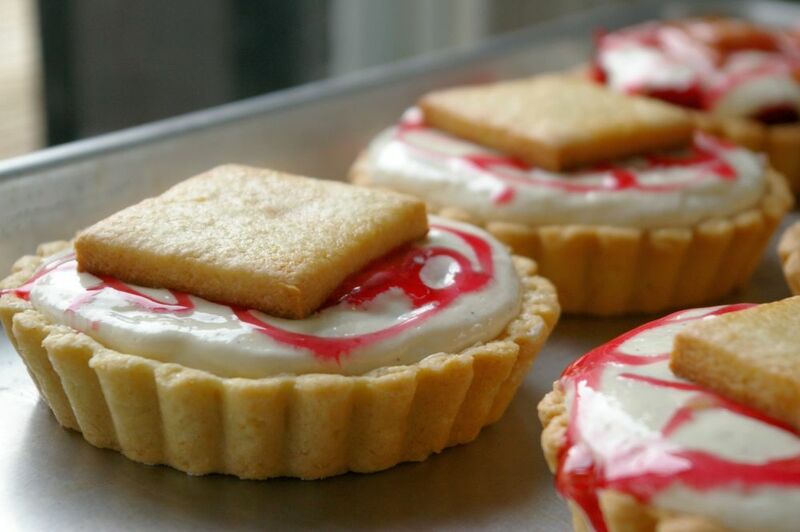 The only ones that had a nice colour are the ones you see on the tart in the picture above, haha. The rest were too green for my likings and so I hid them underneath the cream. Ha, so ugly. The funny thing is that the way I imagine things in my head before I start is rarely how they turn out. There are so many things I would change about what I made today. For example, I would use a different crust recipe that would be easier to break with just a fork. You shouldn’t need to stab the crust to death to break it, or need a knife and a fork to eat a tart. The crust should be light, buttery, tender, and most importantly, delicious. But, it’s all about trial and error right? How would we learn if we didn’t make mistakes and see where we can improve? Also, I wouldn’t forget to put gelatin in my chiboust next time, haha, so the cream was a little too soft/runny for my liking after sitting for a while. The flavours are all really good, really really good actually, I’m just not happy with the textures or the presentation. I think I get too excited about the ideas in my head and just jump on them instead of planning them out with a bit more thought to up my chances of coming out with something I am happy with. Then again, my standards are even too high for myself. Preheat your oven to 320F. Place everything in a deep dish, cover with a lid or with tin foil and bake for about 20 minutes. Check it after 15 minutes to see if it’s the texture you want it. I roasted mine for 23 minutes, the rhubarb still had it’s colour and was soft but still had a bit of bite to it. Perfect for me! while this dough is tasty, I wouldn’t recommend it if you want a light tart. I find it puffs up a bit too much and is almost too hard to cut with just a fork. It does make nice little cookies though, that will keep their shape and not spread in the oven! Sift the flour with the baking powder and salt and set aside. In a mixing bowl with the paddle attachment, cream the sugars with the butter. Add the egg and lemon zest and beat to incorporate without adding too much air. Throw in a teaspoon of vanilla if you want. Then add the dry ingredients and mix until it comes together. Wrap the dough in plastic wrap and refrigerate for at least 1 hour before rolling out to the desired thickness and doing your foncage. Chill the dough once again for about 20 minutes before baking. Bake for about 10-15 minutes or until lightly browned. 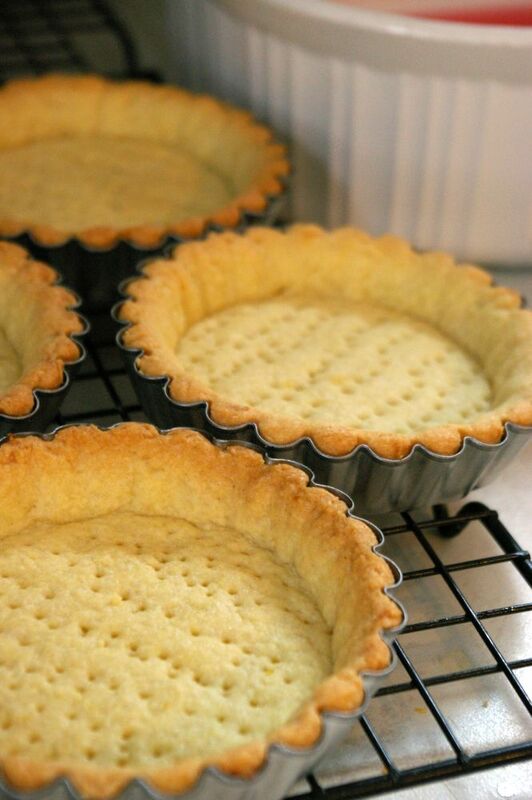 Once they were cooled, I brushed the insides of my tarts with a thin thin layer of white chocolate, so that the crust wouldn’t get soggy. This is called chablonner. Scrape the vanilla bean into the buttermilk. In a bowl, whisk together the sugar, flour and salt. Add the yolks and whisk to incorporate. Add a little buttermilk if you need to just to losen it up and get all the lumps out. Then slowly add the buttermilk and whisk to combine. Pour this into a pot and cook over medium, whisking constantly until the mixture thickens and boils. Remove from heat and pass through a chinois or sieve if you have any little lumps or whatnot. *if you aren’t going to forget your gelatin like I did, whisk it into the pastry cream after you take it off the stove. I made a swiss meringue, so that means I just whisked the whites and sugar in a bowl over a bain marie until the sugar was dissolved, then transferred to a mixing bowl to do the rest of the whipping until it was done. You can fold the meringue and pastry cream together while still a bit warm, it will be okay. Look at these ugly ones!! What’s wrong with them? They look old-fashioned, and the biscuit on top is WAY WAY too thick (but then again, it was an afterthought). 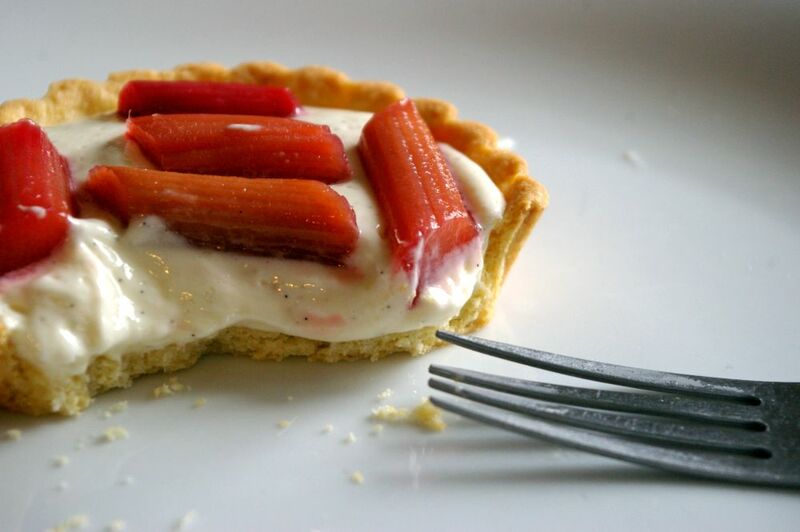 This entry was posted in Partial Rants and Thoughts, Tarts and tagged buttermilk pastry cream, chiboust cream, rhubarb, rhubarb tart, tarts. Bookmark the permalink.